Nearly all inboard gasoline engines, virtually all automotive engines (the old East German Trabant, a notable exception) and many outboard engines are of the 4-stroke variety. The strokes refer to up and down movement of the piston(s). In a 4-stroke engine, one of the strokes produces energy, what’s known as the ‘power stroke.” The other three are in support of the power stroke. The strokes are, in order of operation, the intake stroke, in which a mixture of air and atomized fuel are drawn in; the compression stroke, in which the fuel-air mixture are compressed; the power stroke, whichh is where the compressed fuel-air mixture is ignited by the spark plug, which in turn drives the piston down the cylinder; and the exhaust stroke, during which the combustion gasses are expelled as the piston travels back up the cylinder. This occurs at different times, and very quickly, in a multi-cylinder engine in what’s known as the firing order. The “seal” between the moving piston and the cylinder in which it’s housed relies on piston rings, several of which are installed on each piston. Piston rings are subject to incredible extremes and a hellish existence yet they rarely fail. While they are rings, they are not continuous. They are designed to expand when heated, at which point their seal they create, keeping compression and the force of the power stroke contained, is nearly perfect. As they wear, however, gasses leak past them into the engine’s crankcase. One sure sign of worn rings is excessive blow-by, an oily, steam-like vapor that exits an engine’s crankcase ventilation hose, or from the oil fill cap when it’s removed while an engine is running. As the pistons move up and down, mushroom-shaped metallic valves at the top of each cylinder, located in the cylinder head (typically one each for exhaust and intake although some have more), open and close in a carefully choreographed sequence, allowing the fuel/air mixture to enter and exhaust gasses to escape, and remain closed during compression and power strokes. One notable exception to this protocol involves direct fuel injection engines—vaporized fuel is injected into the cylinder rather than entering through the intake valve. The valve train is composed of the aforementioned valves, as well as the components that actuate them—rocker arms, push rods, lifters, a camshaft, and timing gears and chains—and plays an integral role in the smooth, efficient operation of the engine. It must be properly maintained in order to ensure reliability. Timing between the valves and the pistons is controlled via timing gears and often a timing chain. Timing gears and chains live in the engine’s crankcase where they are continuously bathed in oil, making them long-lived and reliable. Two key elements are worthy of note where the valve train is concerned—valve adjustment or lash—and the integrity of the seal achieved between valve and its seat. If the valve clearance is incorrect, then the engine may not receive the proper fuel-air mixture, which could lead to rough running, reduced power, hard starting, and poor fuel economy. Valve adjustment is straightforward and usually takes no more than an hour or two at most; yet, many of the engines I encounter have never had their valve clearance or lash checked. Engines that rely on hydraulic lifters (which include most GM small blocks) have zero lash, and typically require no adjustment unless disassembled. If your valves have never been checked during your ownership, review your owner’s manual to determine the recommended adjustment interval and have them serviced if needed. Additionally, if valves fail to make a proper seal with their seat, an engine could suffer from low compression, which in turn can lead to a loss of power, rough running and leakage of unburned fuel into the exhaust system. Typically, the condition of valves and their seals aren’t checked unless a problem is suspected, and the method used for determining the condition of these components may take one or two forms, a compression test or differential leak-down test. In both cases, the condition of the valves and valve seats, as well as the piston rings can be determined. However, there is a slight difference between the two approaches. A compression test will do just what it says; test the compression (typical gasoline engine compression is about 125-150 psi). 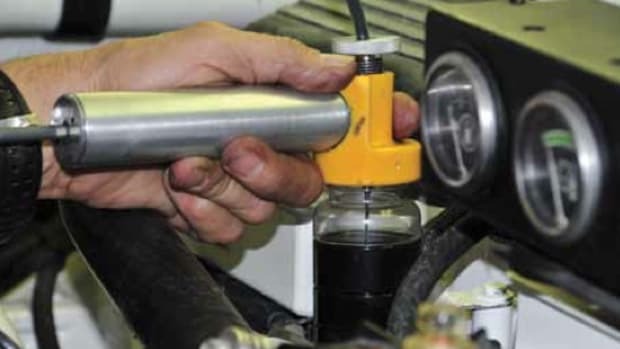 A leak-down test utilizes compressed air pumped into each cylinder. 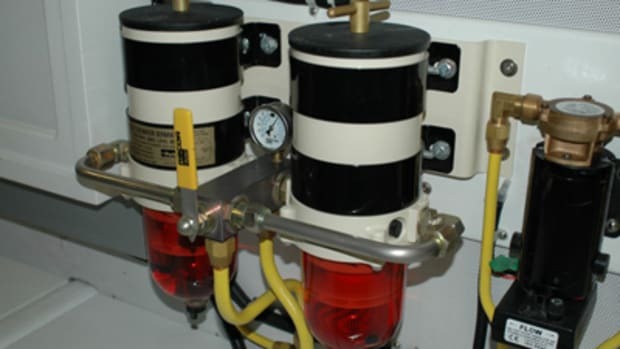 Two gauges are used: one to monitor ingoing air pressure, and one to monitor the air pressure maintained by the cylinder. If the difference is too great, or rings or valves are worn out, damaged, or out of adjustment, the location from which the leaking air escapes will provide a clue as to what the source is. Air leaking from an exhaust or intake manifold indicates a problem with valves, while air leaking from crankcase ventilation points to a problem with rings. Traditional gasoline fuel systems are relatively simple and well understood. Fuel is pumped from the tank to the carburetor via a conventional mechanical lift pump that’s driven by the engine’s camshaft, while later model engines may utilize an electric pump. Most rely on a single stage spin-on fuel filter that’s located between the pump and the carburetor (after-market filters are often installed between the tank and engine or lift pump). Provided you keep in mind cautions regarding the volatility of gasoline and spilled fuel, replacement is straightforward and often very easy. An important side note regarding inboard gasoline fuel filters is they should be UL Marine 1105 approved, which, among other things, means they use no plastic or glass components. All parts containing fuel must be metallic, and they must use no cork for gasket material. Additionally, with few exceptions, all individual fuel system components must meet a two-and-a-half minute flame resistance requirement detailed by both the ABYC guidelines and the CFR, which again rules out plastic components. Marine inboard engines are typically equipped with flame arrestors. While they look vaguely like air filters, flame arrestors serve a different and more important purpose. Made up of finned aluminum or overlapping screens, they are designed to halt the spread of flame that may backfire through a carburetor (flame will not pass through a tightly woven screen or closely spaced fins), which in turn could ignite fuel vapors in an engine compartment. In my experience I’ve encountered many damaged, improperly installed and clogged flame arrestors. For safety sake, make certain yours is present, intact and properly installed and, for the greatest fuel efficiency, ensure that it’s clean. Again, using caution, pour the contents of old fuel filters into a clean glass jar (plastic and metal containers can become electrically charged. If you use one for this purpose, be sure it is grounded, i.e., placed on the ground outside of the boat, or discharged to ground before pouring fuel into it, to prevent a static spark). Look for water or other debris. If copious water is present, it will separate readily from the fuel and sink to the bottom of the container, then it’s likely water is in the fuel tank as well. While ‘water removal’ additives are available, because there’s no way to know how much water is present, the preferred solution is to have it pumped out. 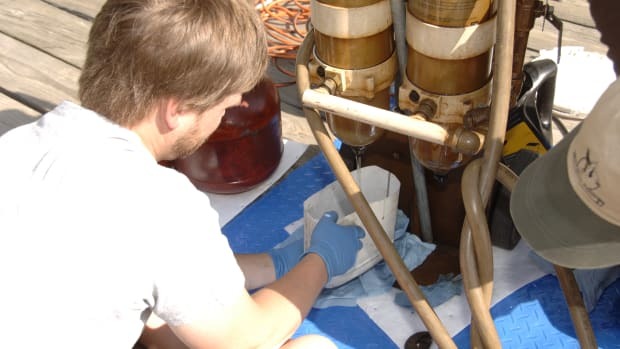 Unless you are experienced in working with gasoline tank cleaning, this is a task best left to professionals. Replacement filter elements should be original equipment or a high-quality aftermarket equivalent. Be sure to follow instructions regarding gasket treatment. In most cases, they call for applying a light film of oil to improve sealing. Often overlooked, many carburetors include en bloc filters—some are plastic, others are sintered bronze. Over time, they will become clogged, leading to fuel starvation. Determine if your carburetor is so equipped and if it is, be sure to service this filter as well. Most new and late model gasoline marine engines are fuel injected. These engines offer a variety of advantages over their carbureted predecessors, primarily in the area of improved fuel economy, smoother running, better cold weather performance, and easier starting. The quid pro quo is greater complexity and less capacity for do-it-yourself troubleshooting and service. In most cases, however, fuel injection systems work well and are reliable, and their advantages far outweigh the shortcomings. The primary malady that afflicts gasoline systems involves the degradation of the fuel itself. Even the highest quality gasoline will, over time, deteriorate. As it evaporates, the residue left behind, referred to as varnish, and with good reason, will clog the small orifices within carburetors as well as float-actuated needle valves. The acrid smell of gasoline that’s gone sour is unmistakable, and for anyone who has ever dealt with the aftermath, it’s also dreaded. Should this happen, carburetors often must be removed, disassembled and cleaned, a task that requires time and a skilled professional or experienced do it yourselfer. The aforementioned relationship between valves and pistons must mesh precisely with yet another sort of timing, that of the spark that ignites the fuel/air mixture. The job of the ignition system is to deliver high voltage, typically over 30,000 volts, from an ignition coil to the spark plugs (while you can get a memorable shock from this voltage, it’s not lethal). The traditional ignition system design relies on a variety of components, all of which work in concert to deliver sufficient energy at just the right moment. Initially the battery, and then the alternator, provides twelve or twenty-four volts to the coil, which in turn converts it to high voltage. It’s then sent to the distributor and on to the spark plugs via high-tension leads. The distributor’s job is two-fold, using either a set of breaker points and a condenser or a magnetic or optical electronic ignition sensor and computer module, it allows the coil to develop and discharge a high voltage charge, while distributing it through a rotor and distributor cap to the spark plugs. The distributor is interfaced with and driven by a gear within the engine, located on the camshaft. The importance of proper spark timing cannot be overemphasized, if it occurs too soon, damage could occur to the engine as the piston tries to compress already ignited fuel/air mixture. If it occurs too late, power and fuel economy may be reduced. Timing analysis and adjustment is carried out by using a timing light, which is attached to the distributor’s number one cylinder high tension lead, and aimed at timing marks located on the crankshaft pulley, on the front of the engine. While observing these marks with the aid of the timing light, with the engine running, the distributor is rotated until the proper advance is achieved, typically between 4° and 8° before each piston reaches the top of its travel, referred or as top dead center or TDC. In order to account for the speed of the piston and the time it takes for the fuel to ignite, the spark ignites the fuel/air mixture just before the piston reaches the top of the compression stroke. If the distributor utilizes breaker points, these too must be periodically inspected, cleaned, adjusted to ensure the gap is correct and ultimately replaced. If your engine relies on a breaker point distributor it makes excellent sense to carry a spare set of points. You should, ideally, be versed their replacement and adjustment. In fact, spares should be carried for all ignition system components that require replacement, including spark plugs, breaker points, condenser, distributor cap, rotor, high tension leads and a coil. Tune ups should be carried out periodically, check your engine manufacturer’s recommendations for the recommended frequency. Tune-ups should always include replacement of spark plugs or, at the very least, removal, inspection, cleaning and re-gapping. Replacement plugs must be those specified by the engine manufacturer, or an equivalent. Before installing new plugs their gap should be checked and adjusted, once again in accordance with specifications established by the engine’s manufacturer. In order to avoid upsetting the firing order, disconnect high-tension leads and replace plugs one at a time. Keep track of the plugs removed so you know the cylinder in which they were installed. Spark plugs are the window to the soul of your engine, they can tell you a great deal about its operating characteristics. Knowing which cylinder a plug came from may help narrow down a problem. Used plugs should be clean, intact and free of oil or soot. A light tan or gray coating is, however, normal. 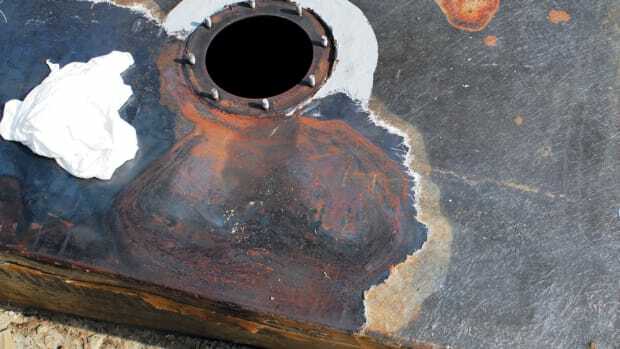 A variety of problems can be discerned from abnormal plug condition, from overheating and clogged flame arrestors to leaking valve guide seals and detonation. Detonation or knocking can occur when (too) low octane fuel is used, if the timing is over-advanced or as a result of a lean mixture, i.e. too much air and not enough fuel. 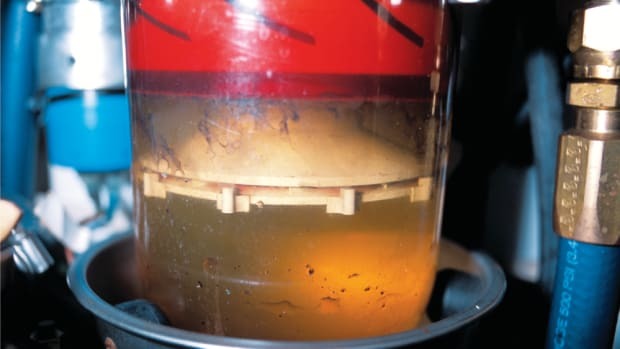 Detonation can result in severe piston damage and thus its symptoms should never be ignored. Pre-ignition, a related problem, can occur when hot spots within the combustion chamber, (caused by carbon deposits, the result of using the incorrect fuel or oil, incorrect spark plugs or a miss-seated valve) cause the fuel/air mixture to ignite prematurely. The flame front created by this ignition collides with the one created by the spark plug, often resulting in piston damage. 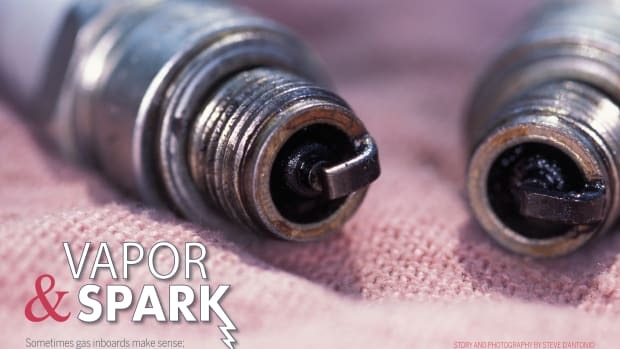 A spark plug that’s turned silver is a clear indication of detonation (the silver is aluminum from the piston), and the need for immediate action if catastrophic damage is to be averted. The distributor cap and rotor should be replaced, along with breaker points and condenser if so equipped. High-tension spark plug wires should be inspected for any signs of cracking or deterioration. Briefly running the engine in the dark will reveal “leaks” in high tension wires, they will be clearly visible sparks. Replace wires one at a time using proprietary silicone dielectric grease on the inside of the boots to improve moisture exclusion and aid in their removal. Ignition timing should always be checked in conjunction with a tune up, along with an inspection of the carburetor flame arrestor. The primary fuel filter, as well as the one in the carburetor, should also be replaced. A general inspection of the engine should also be carried out with every tune up, including, but not limited to, a review of the shift and throttle linkage (only original equipment parts, supplied by the shift, throttle and engine manufacturer should be used), look for loose fasteners as well as worn components. Check belts for proper tension and signs of glazing or misalignment, the latter is evidenced by accumulation of belt dust on the front of the engine. Check your bilge ventilation system, make certain the blower operates (a requirement aboard gasoline powered vessels with enclosed engine compartments) and that it is drawing air and fumes from the lowest section of the bilge, and exhausting them overboard. Blower hoses are notorious for deteriorating, becoming dislodged, tearing and filing with water, make sure yours are in good working order and free of these defects.